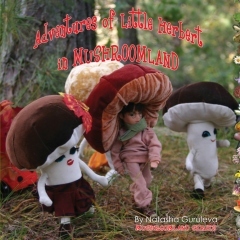 I was excited to receive Adventures of Little Herbert in Mushroom Land by Natasha Guruleva, as mushroom hunting is one of our family’s favorite past times. Mushrooms hold a special lore in children’s literature. Think of the amanita in Alice’s Adventures in Wonderland. It is a catalyst to Wonderland. Many fairy tales include mushrooms, especially those from Russia where author Natasha Guruleva grew up. Adventures of Little Herbert in Mushroom Land is part of the Mushroomland series. There is also a video of this photo-illustrated fairy tale. Just like with Alice, a mushroom (this time a Boletus) is responsible for the change from reality to fantasy. Little Herbert is a shy and retiring boy who dreams of fitting in with his classmates by learning how to play baseball. On receiving the peculiar advice to try and strike the ball while it’s in the circle of the moon, turning it into a lucky charm, Herbert heads out to the sports field late at night to see if he can make this strange prophecy come true. Nothing seems to happen and Herbert becomes frustrated, accidentally striking a mushroom growing in the grass. Suddenly he faints and, as he does so, is magically transported to another world: Mushroomland. Herbert wakes to find he has been saved by a talking mushroom boy called Bolly. Bolly is excited to meet Herbert and suggests that he dress up in a mushroom disguise so that he can quietly fit in to life in Forest Town. Herbert is introduced to Bolly’s sister Tolly, his best-friends Chanterelle and Saffry and even to Bolly’s Grandpa, who just happens to be mayor of the town. Life in Mushroomland is absolute bliss for little Herbert; everyone loves him and looks after him. He even learns how to play baseball with the mushrooms’ help. He and Bolly become the very best of friends. After a while though, Herbert starts to feel homesick. But just as he is about to ask for the mushrooms’ help in getting home, Mushroomland is attacked by a gigantic Slug and a mean army of worms. It will be up to Herbert to find out why the attack was launched, to help protect his new family and friends, and to save Mushroomland. Be prepared…there is a lot of text with this children’s book that is awkward at times. There is no information on the book itself as to the source of the paper. All books should be made from recycled content, in my opinion. I’d think I’d rather go on our family mushroom hunting adventures and look at the field guide…[amazon_link id=”0898153883″ target=”_blank” ]All That the Rain Promises and More: A Hip Pocket Guide to Western Mushrooms[/amazon_link] is fairy tale enough for my kids! Although, the images will probably inspire my children to build more fairy houses out of sticks, leaves, stones, etc. This is a favorite outside activity! Glad to know you are an enthusiastic mushroom hunter. Have you seen Mycophilia: Revelations From the Weird World of Mushrooms, which rounds up all the new science in the field of mycology? Let me know if you want a review copy.